I was lacking inspiration and so I reached for a card sketch to get me started. I didn’t even have to think too far outside of the box as it already had butterflies on it. It was a no brainer to use the free Butterfly Elements. I made a Lovely Lipstick card base and layered a patterned paper piece from the All My Love Designer Series Paper. I was all about stitching at the time of making this card as I had my sewing machine out so I sewed an edge around the patterned paper. BUT I could not stop there! I added a stitched shape rectangle using the new Stitched Framelit Dies. 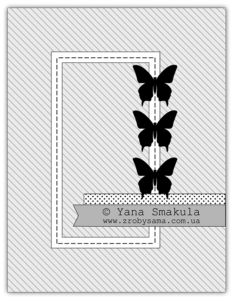 I love the thank you greeting from Butterfly Gala and how the you is incorporated into the greeting underneath and I heat embossed it in white onto another scrap of Lovely Lipstick card stock. I raised the greeting up on dimensionals and added three of the wooden butterflies from the FREE Butterfly Elements pack. You get absolutely loads of wooden elements (84) in the pack and they coordinate beautifully with the Butterfly Gala Stamp set and Butterfly Duet Punch. You can ink, heat emboss, paint, glitter and fill these wooden elements and they really add extra dimension to your project. And what is even better is they are FREE. Yup that’s right! Spend £45 on any crafting goodies you need and choose the wooden elements for free! 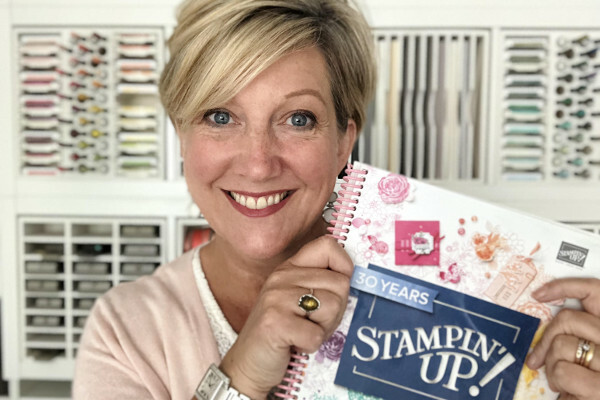 If you need some Stampin Up supplies, simply click any of the images below to go to that item in my online shop and add them to your basket. Once you spend £45, you will be promoted to choose a free item from the sale-a-bration brochure. Please also use the monthly hostess code (shared on the right) as I really appreciate you supporting my business. Wishing you all a great weekend, I’m off I have a team training event on Sunday for 50+ ladies and need to finish up.